What does Wikipedia have to do with monetization, business strategy, and online marketing? That’s the first thing most people will ask when they learn about my involvement with Wikipedia and the free culture movement. Think about it this way, Wikipedia is one of the most popular websites in the whole world. It is dedicated to creating a core product that is free for anyone to use – and yet the Wikimedia Foundation has enough funding that they are considering long-term plans which include the creation of an endowment fund. There was even a recent scandal about Wikipedia building a new search engine in the news that got some press, but largely went unnoticed by people outside the Wikimedia community. Within the community, one of the cornerstones of this conference would specifically address “How to move forward“. With all that has been going on behind the scenes of Wikipedia, the 2016 annual conference was shaping up to be a very interesting event with far reaching repercussions – that most people wouldn’t even notice. If you’re interested in the particulars of the financial status of the Wikimedia project, you can read all about it in the financials section of the annual report. For our purposes here, I’m just going to focus on the fact that Wikimedia is dealing with tens of millions in annual cash flows. I’d say this mostly volunteer maintained project has a good monetization strategy in place. To understand how all this comes together, I’ll need to give you a quick history lesson covering some of the highlights of Wikimedia and Wikipedia. For more information about the history of these projects, check Wikipedia (History of Wikipedia & History of Wikimedia). Today, the Wikimedia Foundation collects the donations and offers grants to local and regional chapters around the globe. Additionally, various WikiProjects have the opportunity to apply for funding through the foundation. The key to Wikipedia’s success is that it lays at the intersection of several types of currency. First, there is the obvious monetary currency that everyone recognizes. However, philosophers have a long history of discussing the desire for fame, community, and power. I don’t presume to know the motivations of everyone involved in the Wikimedia Foundation, but it has been my experience that everyone is motivated by at least one of these currencies. Personally, I’m involved in the Wikipedia project because I have an interest in promoting free culture. These values can be seen in my business endeavors as well as my volunteer work with Wikipedia. Sure, I enjoy being known as “the Wikipedia guy” in some places, and I monetize my knowledge of Wikipedia by consulting for businesses that are interested in publishing content on Wikipedia. However, I also apply my philosophy of “selling without selling out” while engaging in these ventures. 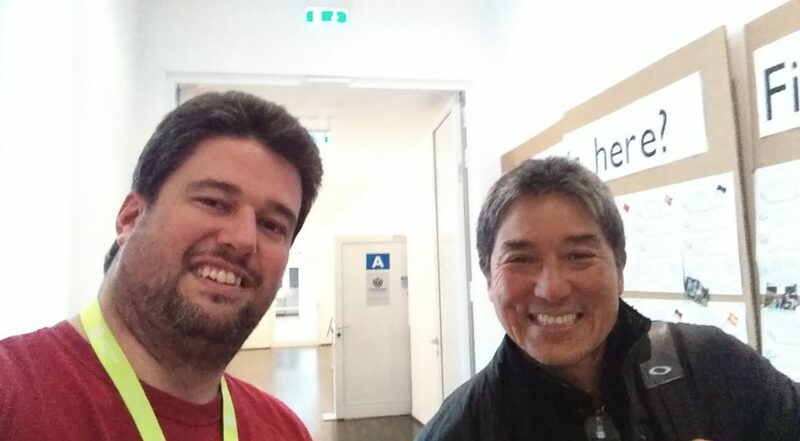 Then there’s the opportunity to meet famous people from around the world, like Guy Kawasaki. I had to stop Guy Kawasaki and take a picture with him after the discussion with Wikimedia Foundation board members. The tens of millions in funding that is managed by the Wikimedia Foundation, the relationship between content on Wikipedia and Google search results, as well as the notoriety that comes with the Wikipedia brand are powerful motivators. Furthermore, the connection with other Wikipedians inside the community helps to keep volunteer editors churning out content year after year. Wikipedians are passionate about free culture and making the sum of human knowledge accessible to everyone on Earth. This business model shows the power of a dedicated group with a shared vision. Just a moment ago, I mentioned the relationship between content on Wikipedia and Google search results. This is where the online marketing component comes in, and it’s where this post gets a little controversial. Like it or not, content on Wikipeida has a strong monetary value. Here’s how this works. Since Google favors content found on Wikipedia over other sources, even nofollow links from Wikipedia have some SEO value while similar links from other sites do not. I don’t care to discuss the motivations for these realities. Rather, I’d like to focus on the simple fact that a significant marketing value comes with a page or link on Wikipedia. This monetary value is enough to motivate people to find ways to game the system and try to introduce spam into Wikipedia just for the backlinks, SEO juice, and entry into the Knowledge Graph. Being part of the Wikipedia community and an online marketer allows me to see both positions on this subject. On the one hand, the marketers want to get their content in front of the massive audience Wikipedia has. On the other hand, Wikipedians want to contribute to the accessibility of the worlds knowledge – not the production of spam. I have regularly brought up issues of notability at various Wikipedia conference and found agreement with many Wikipedians. One of the current standards for notability, having coverage in traditional news media, has multiple problems. For example, corporations with large budgets can easily influence news media through public relations and sponsored content which are outside the reach of most people. Another example that came up at the conference this year has to do with research grant funding around the world. It seems that cancer researchers within Germany are excluded from the English Wikipedia on the grounds that their work is not notable enough. The foundation of this decision seems to be the amount of grant funding they receive, which is significantly less than their counterparts in the USA. The reason, it turns out, is that there is simply more grant funding available to researchers in the USA than those in Germany. In the end, I was able to visit Berlin and connect with some amazing Wikipedians because I have created a location independent business with international clients. After almost a week in Berlin, I have taken a trip to Barcelona and decided to spend a few more weeks in Europe. While I’m here, I will connect with Wikipedians involved with the Catalan Wikipedia project. Although I am in Europe for five weeks, I am still meeting with clients regularly and helping to build their businesses while running my own.